CONGRATULATIONS TO OUR TOP PRODUCERS! Even in the most challenging of markets, true professionals flourish through commitment and effort. EXIT celebrates and honors their success in an annual awards ceremony held at the EXIT Annual Convention in October each year. 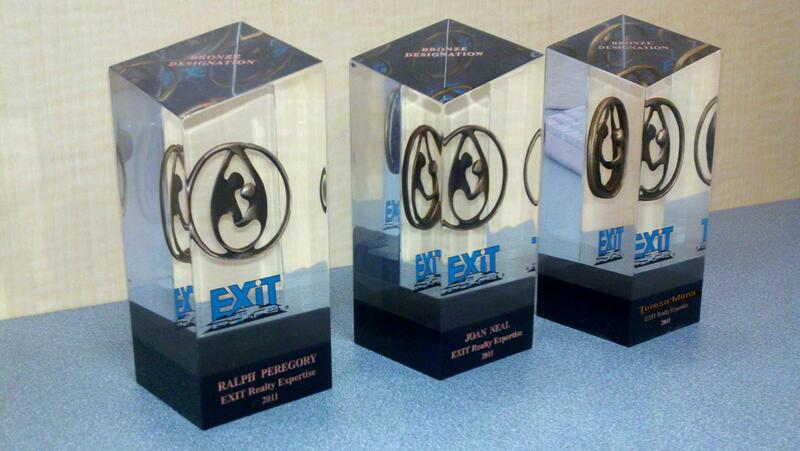 CONGRATULATIONS to EXIT Realty Expertise's TOP PRODUCERS- Ralph Peregory, Teresa Mims and Joan Neal. Each recieved EXIT's coveted Bronze Award for production exceeding 25+ closed transactions in the previous awards cycle. The awards period is for production begininng July 1st and ending June 30th each year. Trophies were awarded this fall during the awards ceremony held at the Gaylord Convention Center in Nashville, Tennessee. Success in real estate at this level is no accident. Successful Realtors excel by their hard work, emphasis on educations, dedication and commitment to being best!